The map of Kenya below shows Nairobi (the capital of Kenya), Mombasa (the second largest city), Kisumu, Nakuru, Eldoret, Malindi, Lamu and other towns across the country. Popular National Parks and Reserves can also be seen: Masai Mara National Reserve, Tsavo East National Park and Tsavo West National Park (the largest in the country), Amboseli National Park, Samburu National Reserve, Lake Nakuru National Park, Nairobi National Park, Mount Kenya National Park, Malindi National Park, Kisite-Mpunguti Marine Park among others. East Africa, boarding Ethiopia (861 km), South Sudan (232 km), Somalia (682 km), Tanzania (769 km) and Uganda (933 km). Total land boundaries: 3,477 km. Coastline: 536 km. Tana River is the longest river in Kenya. It rises in Mount Kenya and the Aberdare mountain ranges in central Kenya and stretches 800 kilometers before entering the Indian Ocean at Ungwana Bay. The river is a major source of hydroelectricity. Galana River has a total length of 390 kilometers and it is the second longest river in Kenya. It rises as Athi River and flows across the Kapote and Athi plains and enters the Indian Ocean just north of Malindi. Lake Victoria is the largest lake in Africa and the main reservoir of the Nile River. It has a surface area of 68,800 square kilometers (26,600 sq ml), a maximum depth of 84 m and an average depth of 40 m. The lake receives its water primarily from direct precipitation and numerous small streams. Lake Turkana is the most saline lake in East Africa and the largest desert lake in the world. It extends 290 kilometers from North to South and 44 kilometers at its widest point with an average depth of 30 meters. The lake has an abundance of Nile crocodiles. Deposits containing pre-human, mammalian, molluscan and other fossil remains found in Koobi Fora on the eastern shore of the lake have contributed more to the understanding of human ancestry and paleoenvironment than any other site in the world. 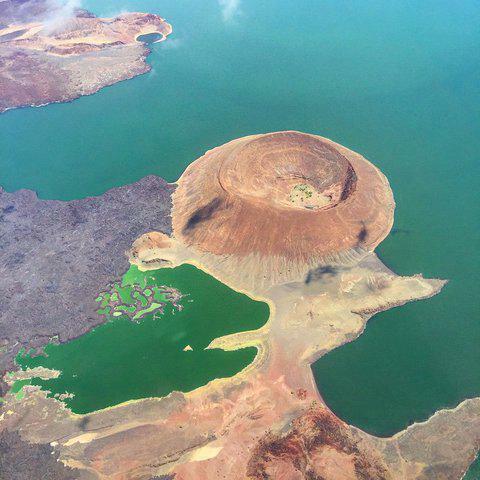 Lake Turkana National Parks are listed as a UNESCO World Heritage Site.